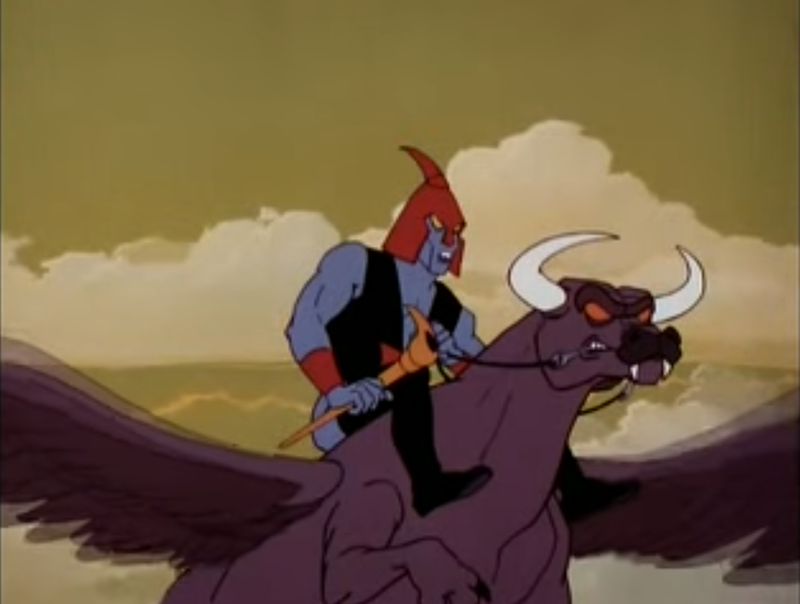 In “The Lord of Time,” the third episode of Filmaton’s sci-fi/fantasy cartoon Blackstar (1981), a minion of the Overlord called a Time Lord -- where have I heard that title before? -- attacks the Trobbits. In particular, the villain named Kadray uses his time scepter to revert the magnificent red tree to an acorn. Because the Trobbits “will be done for without the tree,” Blackstar attempts to prevent the Lord of Time from collecting the acorn. Unfortunately, he fails on his first attempt, and the Lord of Time plans to drop the acorn into the fountain of fire: “a source of great evil” located in the Castle of the Devil Spirits. “The Lord of Time” is a fun episode of this series that sees a minion of Overlord with an amazing power. 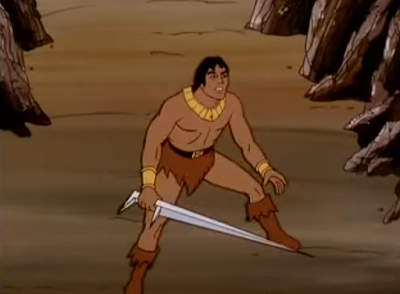 He can use his time scepter to send age or de-age any object. He not only turns the Trobbit tree into a big red acorn, he evolves a Sagarian insect to turn into a giant, buzzing menace. 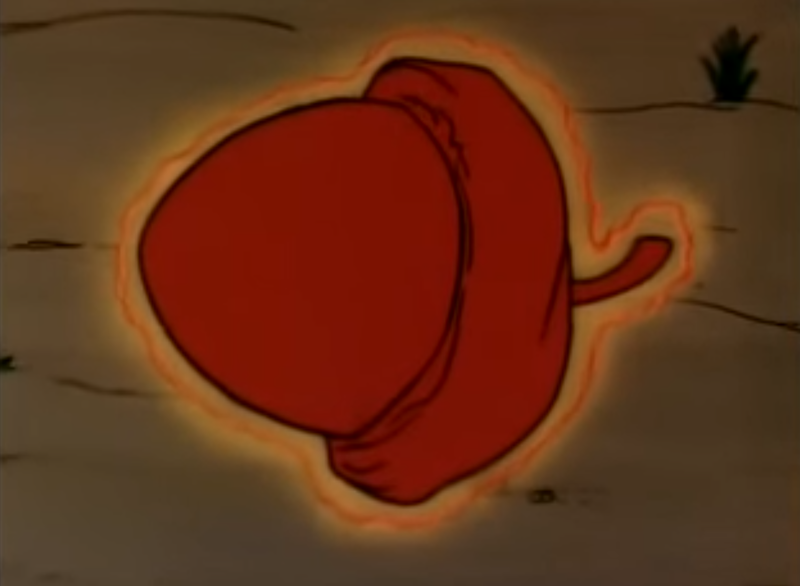 The episode is very creative in its use of the specter. For instance, the Time Lord discovers that the Fountain of Fire is guarded b peaceful sprites who won’t do his bidding. Therefore, he reverts them to a prehistoric form, as savage, cruel warriors who will do his bidding. Quite a weapon. The other intriguing element of this episode is that it attempts to imbue John Blackstar with a bit more in terms of distinguishing personality. He wise-cracks a lot in this episode, which is new. “It’s time for a rewind,” he jokes. Or “my how time flies,” he observes. While these moments may sound goofy, in fact they go a bit towards making him a larger-than-life hero. In the previous two episodes I noted that Blackstar, while a great fighter, doesn’t have much personality or drive. In fact, Mara seems a far more important “rebel” in “City of the Ancient Ones,” and “Search for the starsword.” Through his bad punning here, Blackstar begins to take on some color, at least.